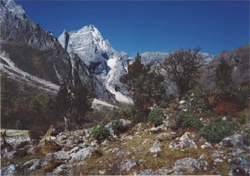 The mountain ranges of Western Sichuan are among the most attractive in the world. The Giant Panda lives here and the ancient Tibetan culture originated on its vast pasture lands. Amdo and Kham – the two legendary cultural provinces of Eastern Tibet bear	magnificent monuments and treasures such as relics of the Boen-Buddhism or the wetlands of Zoigê. The landscapes are rich in contrast and offer plenty of unique features: The edge of the humid Sichuan basin, steep and narrow canyons alternating with ice-capped summits and last but not least vast grasslands make this land an inimitable scenery. As specialists for Western Sichuan we organize trekking tours, mountain expeditions, bird watching and culture tours. Each single journey will be tailored to your individual requirements and within the principles of sustainable tourism. Both, groups and single adventurers are welcome to profit from our service and knowledge. Our activities are based on respect for mountains and culture. Consciously and with great care we move through the fragile ecosystem. In touch with the nature and the native people we experience the miracles this beautiful land has to offer. Its unique features and unforgettable stories will affect you deeply and provide you with precious and lasting memories.